Gujarat B.Tech Counselling 2018: The Admission Committee of Professional Courses also popular as ACPC is the conducting organisation of GUJCET Counselling 2018. Thousands of candidates each year take admission in various govt. and private engineering colleges that are located in Gujarat state only. The candidates who are seeking admission in the engineering field of study then they must apply through Gujarat CET Counselling 2018. we are providing you with the detailed information about Gujarat Engineering Admission Process 2018 such as filling of GUJCET Counselling Application Form, choice filling, verification process of documents and other sub-Processes. At last, each of the candidates would get finalized seat in one of the branches of the engineering course offered by the institutions located in Gujarat state. All the students who are seeking admission in the engineering course in any of the institutions in Gujarat state must apply to this GUJCET counselling schedule. The GUJCET 2018 Selection Process will be based on 40% marks scored in GUJCET 2018 entrance examination and rest 60% will be dependent over the XII level education Marks. After combining both the marks, the final GUJCET Merit List will be declared. Kindly check all the important details of the counselling in this article. To get appear in Gujarat B.Tech Admission 2018 Counselling, each one of the candidates is required to fill the registration form of the counselling and then they will be called for the document verification followed by choice filling process. 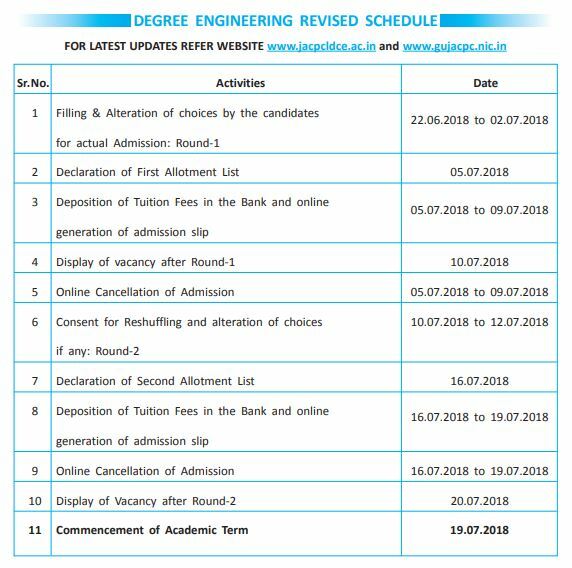 One should always keep in mind that failure in any one of the process may lead to the cancellation from the Top Engineering Admission Counselling at any time. At last stage of the counselling, candidates would get a confirm seat through GUJCET Seat Allotment Result. The Gujarat CET Application Form will soon be available on the official website. All of the selected candidates of GUJCET are suggested to fill the Gujarat Engineering Counselling Form before the deadline of the date of the submission. All the selected candidates have to pay Rs. 500/- as the registration fee. Later, The candidates will be asked to showcase their choices of the institution in which they want to study. In order of their marks in GUJCET & 10+2 education, their choices will be accepted. These are the necessary document that needs to be carried out for the verification process during the counselling. The applicant must have completed XII level education from a recognised institution with minimum cut off marks. The candidates must have qualified GUJCET 2018 with minimum cut off marks decided by ACPC. The Admission Committee of Professional Courses (ACPC) will release Gujarat engineering Admission Seat Allotment List in the Second week of July. Those candidates who have performed in GUJCET Counselling well will be selected. The Gujrat Engineering Admissions 2018 is one of The Leading Engineering Admission in India. As early as the committee will release the Gujarat CET Merit list we will update the same on this article also.